DNA–DNA interactions are essential to many biological processes, including DNA replication, recombination and compaction. While side-by-side interactions between two or more DNA molecules have been the subject of many studies, end-to-end interaction of duplex DNA and its role in cell biology and DNA nanotechnology remains almost entirely unexplored. 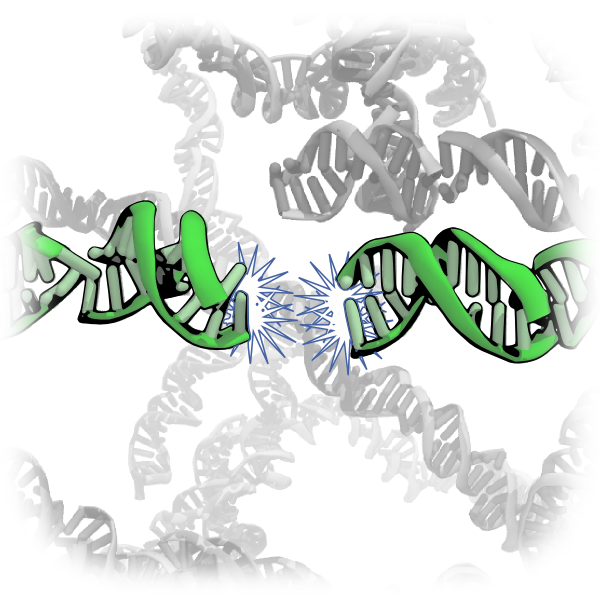 Recent experiments demonstrated spontaneous end-to-end association of short duplex DNA fragments into long rod-like structures. To determine the microscopic origin, magnitude and range of forces driving this spectacular self-assembly, we carried out the first direct study of end-to-end association using the all-atom molecular dynamics method. Our state-of-the-art free energy calculations combined with brute-force simulations of spontaneous self-assembly revealed the standard binding free energy and kinetic rate constants for the end-to-end interaction. We found the end-to-end force to be strong, short-range, hydrophobic and only weakly dependent on the ion concentration. The relation between the stacking free energy and end-to-end attraction was discussed as well as possible roles of the end-to-end interaction in biological and nanotechnological systems. This work is described in a report appearing in Nucleic Acids Research.